The Airport Pavement Structural Design System (APSDS) is the leading edge pavement design package for Airports and Heavy Industrial Pavements such as intermodal container terminal pavements. The unique APSDS methodology rigorously incorporates lateral vehicle wander and state-of-the-art pavement material properties and performance models. This page shows how leading Danish consultants, RAMBOLL, have used APSDS on major airport pavement design and rehabilitation projects. APSDS was used for the design of runways (4.3 km), deicerplatform (7,000 m2) aprons (50,000 m2) at Billund Airport (the second largest airport in Denmark with some 2 million passengers yearly). The pavement included flexible and semi-flexible structures. 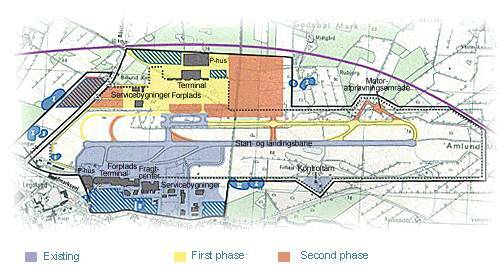 Due to increase in traffic Billund Airport decided to expand the capacity by building a new terminal on the opposite site of the runway of the existing terminal. RAMBOLL was commissioned with the detailed design of all pavements in connection with the expansion, including geometric and pavement design. The pavement included new runways (4.3 km), aprons (50,000 m2) and a deicerplatform (7,000 m2). 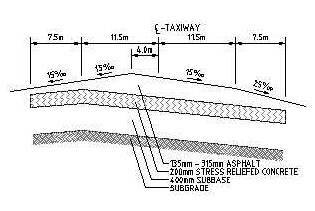 The pavement structures included flexible and semi-flexible pavements were all design using APSDS. During construction the quality and bearing capacity of the unbound materials will be controlled by the used of Falling Weight Deflectometer. According to the results the thickness of the upper pavement layers is adjusted using APSDS. Due to advanced pavement deterioration Copenhagen Airport decided to rehabilitate taxiway C. RAMBOLL was commissioned to carry out the pavement design of the taxiway. The rehabilitation consisted of stress relieving the existing concrete slabs. On top of this layer the necessary thickness of asphalt placed. Prior to placing the asphalt the quality of the stress relieving was investigated by the use of Heavy Weight Deflectometer to ensure a homogenous base course. After rehabilitation the pavement design was controlled using APSDS and elasticity moduli derived from HWD testings. RAMBOLL carries out yearly an evaluation of the pavement conditions of the three runways and major taxiways at Copenhagen Airport. The runways consists of 04L-22R (3,6 km), 04R-22L (3,3 km) and 12-30 (3,1 km). The taxiways have a total length of some 27 km. An important part of this evaluation is the assessment of the residual structural servicelife, which is calculated using APSDS. For further details on APSDS Case Studies click here.